Sierra Leone (Listeni/sɪˈɛərə lɪˈoʊnɪ/ or /lɪˈoʊn/), officially the Republic of Sierra Leone, is a country in West Africa that is bordered by Guinea to the northeast, Liberia to the southeast, and the Atlantic Ocean to the southwest. 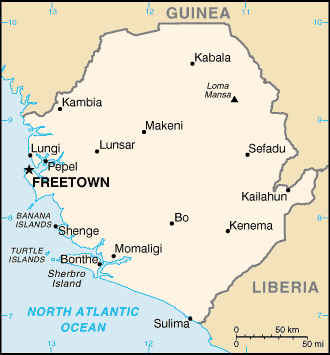 Sierra Leone is a Constitutional Republic with a directly elected president and a Unicameral Legislature. The country has a tropical climate, with a diverse environment ranging from savannah to rainforests. The country covers a total area of 71,740 km2 (27,699 sq mi) and with an estimated population of 6 million (2011 United Nations estimate).